CBD Living takes the science of nutrition to the next level with their range of CBD infused products. They have broken grounds, using quantum physics and nano technology to infuse CBD into their consumables, ensuring that your endocannabinoid system is well-fed and optimized for the healthy functioning of the neurological and immunological systems. 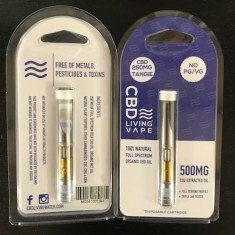 CBD Living presents their pure CBD Vape Cartridge in a 510 thread cartridge. The ½ gram vape oil contains 250 mg of pure natural full spectrum CBD oil. CBD is known to combat a myriad of symptoms and serious medical conditions including cancer, impaired immune system, tissue inflammation and neurological defects. While CBD can also treat conditions such as acute and chronic pain, anxiety, and general stress symptoms, it neither contains nor gives the effects of the psychoactive. CBD Living Vape Cartridges are available in natural, bubble gum, sour diesel, and tangie strain flavors. This vape oil contains the original aromas and flavors of the flowers from which the oils are extracted. No glycerin, glycol, or additives added. An ideal substitute for cigarettes, nicotine patches, or even smoking THC! Ive been using CBD products fro about 2 years, came across an article on this website and found them thank god. I say thank god because i cannot find this product anywhere else!! The CBD Oil is pure FULL Spectrum CBD Oil.. Which a lot of companies claim but, CBD Safe actually has this CBD Oil and delivery arrived quickly, im a fan!! Natural Terpenes ! Great experience…. Just a top notch CBD vape cartridge. Great way to get your dose of CBD anywhere, anytime. Need Living CBD Vape Cartridges per week, effective product!!!!! So pure and natural !!! !